Take a look through winter’s window—there’s still a garden of delights to behold. This past year has been a series of meteorological quirks and records—and annoyances for gardeners. But despite the reality of global warming, incessant rain and whatever else, we can rest assured that each year, following autumnal colours and delights, winter prevails. Thus comes the cold, the grey days and the snow—as well as a unique opportunity for gardeners. Contrary to what most people think, winter is more than merely a season of hibernation in our gardens; it offers insights and visual delights. There may not be fragrances and bright colours, but it’s pleasant to behold the sometimes amorphous shapes of snow-capped shrubs, the earthy hues of foliage, bark and seed heads. It’s a softer, more subtle sort of garden, especially when snow wafts gently down or sunlight adds watercolour shadows to the mix. We just relax, enjoy what’s already planted, and think about what we might want to do next spring. Other than the occasional walk around to fill bird feeders—and perhaps a late planting of bulbs during a temporary thaw, not that I’m speaking personally, you understand—we tend not to be out in our gardens during winter. We spend more time looking at them from windows, which provides an overall view of our plantings. 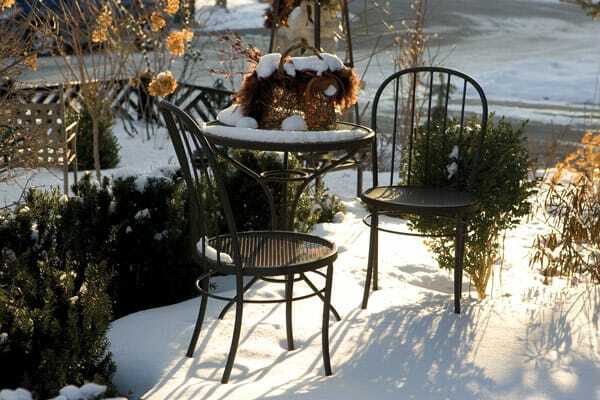 Winter is when the “bones” or framework of our gardens shine—or show flaws in a garden’s layout. Bones are created by structures such as trellises and fences, as well as by plants. Don’t despair if you have a long-established garden where the bones aren’t as remarkable as those you see in gardening TV shows or magazines, however. It’s your garden, and it’s important that you plant what you like, where you like it—and where it will grow well. Beautiful bones are in the eye of the beholder.